^ 1.0 1.1 Ho, Solarina. UPDATE 4-Bombardier unveils high-stakes CSeries jetliner. 2013-03-07 [2018-09-22]. （原始内容存档于2018-09-22） （英语）. 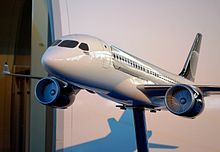 ^ 2.0 2.1 2.2 Airbus and Bombardier announce C Series Partnership. 2017-10-17 [2017-11-16] （英语）. ^ 3.0 3.1 Le CSeries de Bombardier devient le Airbus A220. 蒙特利爾日報（法语：Le Journal de Montréal）. 法新社. 2018-07-10 [2018-07-10]. （原始内容存档于2018-09-22） （法语）. ^ Bombardier. 龐巴迪公司. [2018-09-22]. （原始内容存档于2011-10-02） （英语）. ^ Warwick, Graham. Bombardier chooses geared turbofan to power CSeries. Washington DC: Flightglobal. 2007-11-13 [2016-06-29]. （原始内容存档于2018-09-22） （英语）. ^ 龐巴迪決建C系客機 耗油少對手兩成 初步獲德航30架訂單 魁省航空業現生機. 2008-07-18 [2018-08-08]. （原始内容存档于2008-10-10） （中文）. ^ 國際/龐巴迪C系列飛機重返藍天. 2014-09-08 [2014-10-07]. （原始内容存档于2014-10-10） （中文）. ^ Bombardier resumes test flights for CSeries jet. Reuters UK. 2014-09-08 [2018-09-22]. （原始内容存档于2018-09-22） （英语）. ^ Bombardier CS300 Aircraft Successfully Completes Maiden Flight. 2015-02-27 [2015-03-08]. （原始内容存档于2015-03-03） （法语）. ^ What will happen to Bombardier jobs after the Airbus deal?. 2017-10-17 [2017-11-16]. （原始内容存档于2018-09-22） （英语）. ... given that they didn't even have a product to compete with the CSeries. ^ The Little Plane War. Wendover Productions. 2017-11-07 [2017-11-16]. （原始内容存档于2018-09-22） （英语）. ^ Entente Bombardier-Airbus: «Une bouée de sauvetage», dit un spécialiste. 蒙特利爾日報（法语：Le Journal de Montréal）. 2017-10-16 [2017-11-17]. （原始内容存档于2018-09-22） （法语）. ^ Bombardier Sells 10 CSeries Jetliners to Sweden's Braathens Aviation. 2011-06-01 [2012-03-24]. （原始内容存档于2012-03-24） （英语）. ^ Major Network Carrier Places Firm Order for 10 CSeries Aircraft; Will Take First CS100 Aircraft Delivery. 2011-06-20 [2012-03-24]. （原始内容存档于2012-03-24） （英语）. ^ airBaltic turpmākam attīstības izrāvienam pasūta līdz pat 60 CS300 lidmašīnām. 波羅的海航空. 2018-05-28 [2018-08-12]. （原始内容存档于2018-09-22） （拉脱维亚语）. ^ Bombardier BD-500 CSeries Operators. planespotters.net. [2016-12-14]. （原始内容存档于2018-09-22） （英语）. ^ Mary Kirby. Bombardier divulges further details about new CSeries specs. Flightglobal. 2009-03-16 [2014-01-21]. （原始内容存档于2018-09-22） （英语）.